it's you and your friends. —Stars, "The Last Song Ever Written"
I have a theory about the end of Mass Effect 3. Not a serious theory, mind you. A crazy theory, the kind even I don't take seriously, but find it fun to think about. Essentially, it's that everything in the Citadel DLC is not preceding the final events of the campaign but that it follows them. Spoilers follow for Mass Effect 3 and the Citadel DLC. Mostly, Shepard dies at the end of Mass Effect 3 (with one exception), which isn't problematic for my theory—it's actually essential to it. My theory is that Shepard does die in the final moments of ME3's campaign, and the events of Citadel are a kind of afterlife. The lyric at the top of this article is from a song by Stars called "The Last Song Ever Written". It's a poetic, beautiful take on death. It's also a comforting take on death, that sees it as a final separation before an eternal joining. It's purely conjecture on my part, but it was sparked by something in the DLC. On the Silversun Strip, the area of the Citadel in which the DLC occurs, you can speak with a virtual intelligence assistant who points out local features. Strangely, you can ask about an area that is not on the Silversun Strip, and has nothing to do with the DLC events at all. It's a nightclub on the Citadel called Purgatory. You can visit the Purgatory club just like you could before, but none of the DLC content changes anything there. For some odd reason, Shepard can just ask Avina (the virtual intelligence) about Purgatory. Avina responds strangely. She starts to define what purgatory is - the religious concept, not the nightclub. Shepard interrupts her, and clarifies the inquiry was about the nightclub. Avina responds, even more peculiarly, that there is no record of Purgatory. This is likely just oversight, or some attempt to allude to Purgatory being a shady establishment. But logically, it is impossible. You can still visit Purgatory even after updating the game with the Citadel DLC. It certainly hasn't shrunk in size; it still has three stories and hundreds of patrons. There's a still a transit system hub right in front of it, in an area where there are no other establishments or features around. The Citadel authorities can't, in all seriousness, not have any record of it. I asked myself immediately why a reference to the afterlife would be included, and that's when it dawned on me that a way to read Citadel is that Shepard is dead, and this is a kind of anti-purgatory limbo he's stuck in—it just happens to have an awesome apartment, all his friends, a casino and an arcade. Basically, it's an awesome way to be dead. But I couldn't think of many other connections. Silver is often used as a metaphor for a link between the spiritual plane and physical plane. Tying that to the setting of the DLC, the Silversun Strip, feels like a stretch. In the DLC you face a clone of Commander Shepard. Witnessing a doppelganger is a typical omen of death, but in my theory Shepard is already dead, so I'm not sure that fits either. I think I like the idea because it has a finality to it regarding all the things fans said they wanted—Shepard with your squadmates, happy and celebrating. For some that's ruined by knowing it all ends badly, but for me this theory spins that take, and makes it so the time spent on the Citadel with friends is the last image. • This is a post about Skyrim and Self Deception "Ulfric Stormcloak, a true Nord and the Jarl of Windhelm, stormed the city of Solitude. I helped him do it. I charged in at his side, as we burned and murdered a path to the Imperial fort inside the city." "I liked the idea of fighting terrorists, felt little to no remorse over killing them. I enjoyed the power fantasy - lurking, crouched in shadows, then striking, making a bad guy whimper in pain until I got what I wanted. I was thirteen. I wasn't conscious of it, but I was being fed, and readily accepting, the idea that killing terrorists was easy, fun, and necessary." • This is a post about Gunsmith and the gentle loving of precision killing "The Rifleman's creed was written during World War II, in either 1941 or 1942. The exact date of its origin is unknown. " The original ending of ME3 unintentionally offended people's perceptions about death. It offended them so much that in addition to outright denying that the original ending even happened, fans clamored for a rewrite. And to some extent, they got it. The Extended Cut DLC from Bioware was a seldom seen response to a fervent disapproval of a game's conclusion, and while the reasons for people's displeasure are diverse and intricate, I think a major (and mostly undiscussed) factor is death and how we perceive it. Without the EC content, all of the endings were vaguely similar, and generally just vague. For all of the things the EC fails to do, it addresses the vagueness of Shepard's death so that it becomes easier for people to accept. There are still massive storytelling shortcomings even with the EC, but it deals with this one serious failing of the original ending. With the EC, in the Control ending Shepard essentially becomes deified, overseeing the galaxy, controlling former enemies and aiding allies. 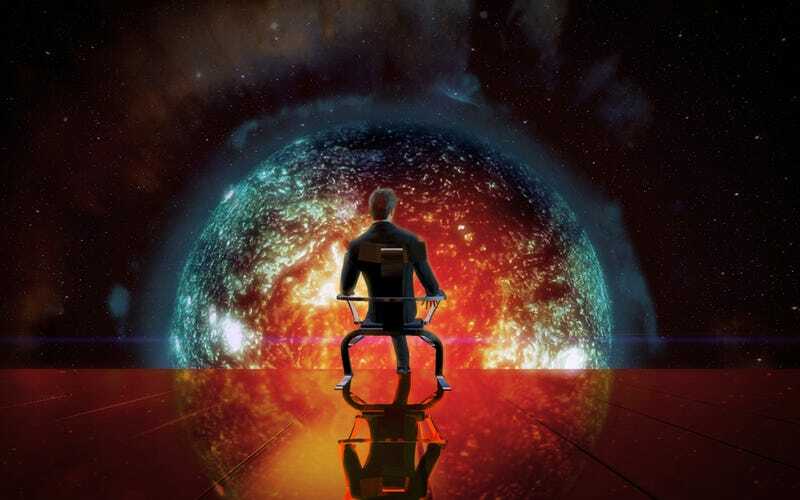 In the Synthesis ending, Shepard's essence is joined with everyone in the galaxy, synthetic or organic, and serving as a catalyst for their merger. These are common ideas for death and afterlife (becoming supernatural or your consciousness being absorbed back into nature of the universe). These clarifications in the EC hardly change the sour taste of a undeniably botched ending, but they were enough for a large portion of fans to at least accept Shepard's end even if they still didn't like it much. But even despite the EC, some people still don't accept it. Personally I've come to accept the Destroy ending. But even so, I'm still coming up with alternate theories like the one above. Why is that? Why so many mental back flips just to avoid what's clearly in the content? The Indoctrination Theory is the earliest and most successful of these alternate theories. The Indoctrination Theory (IT) is that the trilogy's antagonists, the Reapers, used their mind control abilities (Indoctrination) to trick Commander Shepard, and the players, into a false choice where every available choice actually leads to defeat, or in the case of the Destroy ending, apparent defeat. IT supporters claim the only correct option to take is the Destroy ending, because the other two endgame choices spare the Reapers. The theory is essentially proposing the entire end sequence is a hallucination, that it doesn't really happen. And the whole point of it is to trick you into not destroying the Reapers, your stated goal throughout the trilogy. The only way to win is to destroy the Reapers and end the hallucination, even though the actual content in the game doesn't at all show that destroying the Reapers ends any kind of hallucination. What happens in the case of the Destroy ending is exactly what the player is told will happen. The Reapers are destroyed, along with some collateral damage and arguably some innocent folks. But the amount of reasoning and logic that has gone into IT is staggering. It would need its own post to deconstruct. This much fervency, this much thought going into a theory aimed at entirely undoing the events clearly shown in a game is a powerful phenomenon among a fandom, but it's not unprecedented. The death of Aeris in Final Fantasy VII also sparked countless theories and speculation that the character wasn't really dead. Theories included that she shouldn't have died based on her wounds, and that players could somehow unlock a different outcome where the character lived. Huge convoluted theories emerged and people vehemently defended them. Certain combinations of in-game items, specific events triggered, and the level of your party members could somehow save Aeris. In issue three of Kill Screen magazine, Brian Taylor covers the save Aeris phenomenon in great detail (it's some of the best games writing I've ever read) and it's not surprisingly similar to Indoctrination Theory. The same hopeful desperation has developed around IT because of all the things we're forced to reckon with through fiction, death is the one we're most sensitive about. For everything the Extended Cut brought to the table it still didn't let us a chance to join our crew one last time. Your crew is what the series was always about. That last chance is worth some mental rewrites. Citadel is a snapshot, and the pinnacle, of camaraderie and companionship in the Mass Effect series. And in game, the iconic moment of the DLC is when your crew actually snaps a photo of their party, so the memory can last forever. And in my take, that moment does last forever. It's the last thing Bioware gave us that's related to the story and characters of this trilogy. It's the last thing I'll play, the last time I ever play Mass Effect 3. The endings from the Extended Cut were needed because of how botched the original endings were. Bioware said all along there wouldn't be a major overhaul to the ending through DLC, but I think in some ways they reversed on that in the end. Citadel is the ending Mass Effect deserved, even if it's not the one it needed when everyone was watching. This is a quieter end for a trilogy that spokes volumes about what could be achieved in storytelling, world building, and characterization through games. It's quiet, and profound, and true. In so many ways, a fitting end. Jordan Rivas was going to be a journalist when he grew up, but figured out professional journalism makes writing less fun. He writes independently at sortiv.com and concocts tweets @sortiv on Twitter. This article was republished with permission.